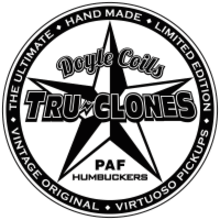 Guitar Heaven – We are the Doyle Coils TRU-Clones Company and Specialize in all things Les Paul. Thanks for visiting... we've been admiring, working on, modding, fixing, and of course playing Gibson Les Pauls for over 40+ years. We have bought, sold, traded, modded thousands of guitars over the decades... and now you can come to "The Source" directly. Come see our new site which will serve as an online catalogue of what guitars we are currently offering, as a place to get our Doyle Coils TRU-CLONES PAF Humbuckers, assorted upgrades & vintage parts… you can have work done on a guitar you already own, and much more! $85.00 Flat Rate Shipping Applies to Lower 48 Continental United States. All other locations will be charged according to USPS Priority Mail costs. ATTENTION: International Buyers will be required to pay an additional 3% fee of the selling price to cover added transaction and handling charges... No Exceptions. Thank you.